(BCHR/IFEX) - The Bahrain Center for Human Rights (BCHR) confirms that the authorities have taken measures to effectively block local access to the electronic blog of Abduljalil Alsingace, ( http://alsingace.katib.org ). This is the first blog, a personal homepage, to be blocked by an administrative ministerial order, as part of a censorship campaign initiated over a month ago by the newly appointed Minister of Information, Mai Al-Khalifa, a member of the ruling family. Alsingace's blog, "Al-Faseelah", which is named after a young palm tree, is posted on Katib "Writer in Arabic", a program aimed at "providing an opportunity for intellectuals, rights activists, young people and the Arab world to publish on the web without restrictions except for hate speech" (see http://www.katib.org ). Katib is sponsored and maintained by the Arabic Network for Human Rights Information ( http://www.anhri.org ), a non-Bahraini site also blocked by the authorities. Alsingace uses the "Al-Faseelah" blog to post news, human rights reports, poems, advertisements, videos, portraits as well as articles, published by him and others. "Al-Faseelah" contains links to human rights organizations, questionnaires about the role of non-governmental organizations, and adverts calling for the prosecution of torturers. 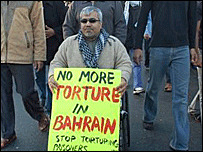 On 27 January 2009, Alsingace was officially banned from traveling and leaving Bahrain after bogus allegations were issued against him, accusing him of being involved in a "terror" plot, being a member of the HAQ movement for Liberty and Democracy, and suggesting that his articles were provocative and had "incited hatred against the regime". Alsingace, as well as other activists, are facing charges based on the Barhaini Terrorism law of 2006 and the Penal Code of 1976, a punishment which could amount to life imprisonment. BCHR president Nabeel Rajab stated: "This is a red blink signal marking an ominous deterioration in human rights in Bahrain, particularly in the level of freedom of expression by activists and dissidents". He added: "The authorities, launching many electronic projects, should realize by now that people can easily circumvent any blocked site, and further censorship on site of dissident voices will do nothing but tarnish its image". RECOMMENDED ACTION: Send appeals to the authorities: - asking them to respect freedom of expression, particularly for human rights defenders, whose views are important for the maintenance and protection of general rights and liberties - calling on them to stop preventing human rights defenders from accessing the media and blocking their means of communications to the public.